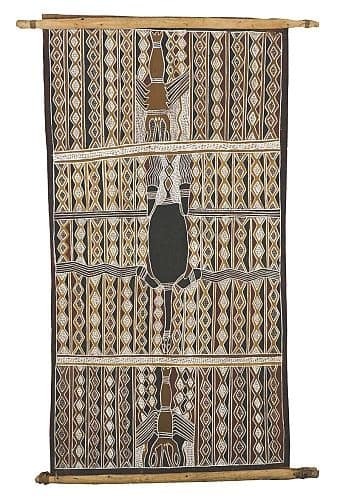 If you have a Gawarrin Gumana bark painting to sell please contact me. If you want to know what your Gawarrin Gumana painting is worth to me please feel free to send me a Jpeg. I would love to see it. 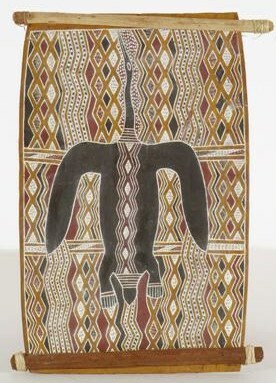 Gawarrin Bark Paintings are a combination of crosshatched sections interspersed with totemic animals. Totemic animals include: fresh water turtles, fresh water prawns, fish and cranes. Many of these barks are of Laintjun an ancestral hero. The ancestral hero Laintjun came out of the sea in the Dreaming with the sea foam forming the diamond patterns on his body. Laintjun taught the Dalwangu Clan how to paint the diamond pattern and the meaning of them. When Laintjun first arrived from the sea as an ancestral spirit, he assumed a human form. He later searched the Arafura swamp and found and ate the “Sacred Honey Comb” and so became a spirit man. In time he became the greatest warrior and hunter in all Arnhem Land. Gawarrin suffered from leprosy as a young man. He moved to Channel Island leprosarium for treatment. He had to undergo treatment for more than a decade. It was during this time that he learned to paint often depicting stories of his country. Eventually, Gawarrin returned to Arnhem Land and settled at Yirrkala. Being the eldest son of the clan leader Birrikidji he soon became an important and influential leader. He lead the Yolngu people especially on land ownership and management. 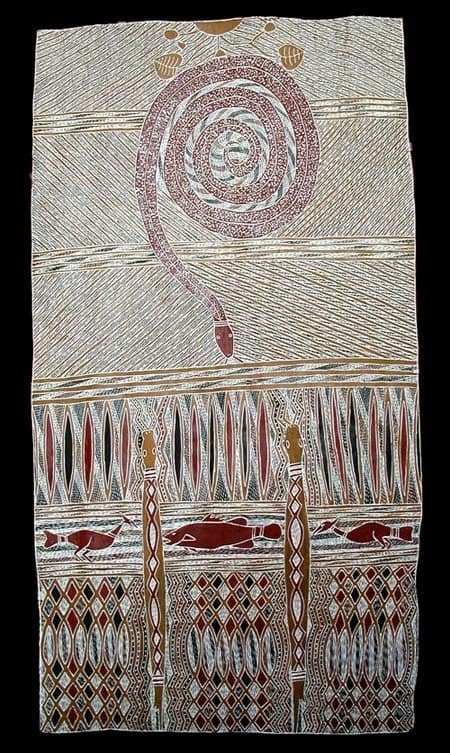 Gawarrin Gumana assisted his father in the painting of the Yirrkala Church panels.